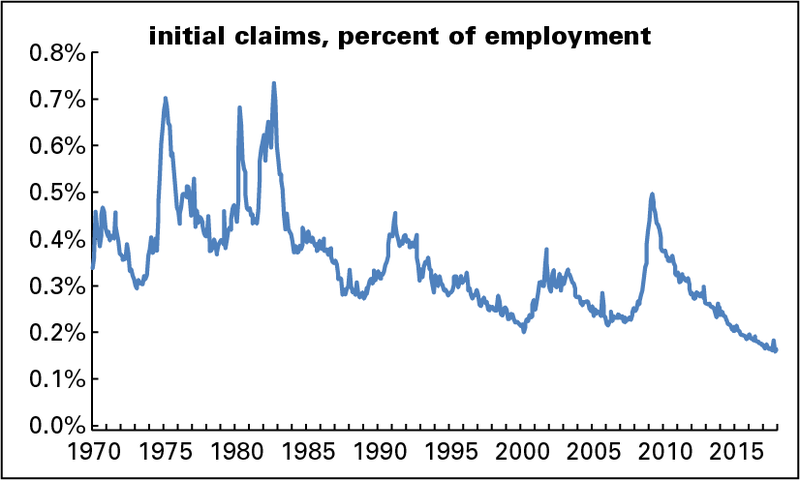 Much has been made of the low level of first-time unemployment claims. They are low, no doubt about it—0.16% of employment, a hair above March’s record low of 0.15% and well below the previous record of 0.20% set in March 2000. (You can say similar things about continuing claims.) But, as we’ve noted in the past, the record comes with an asterisk. That asterisk is the declining share of the unemployed who are eligible for benefits. 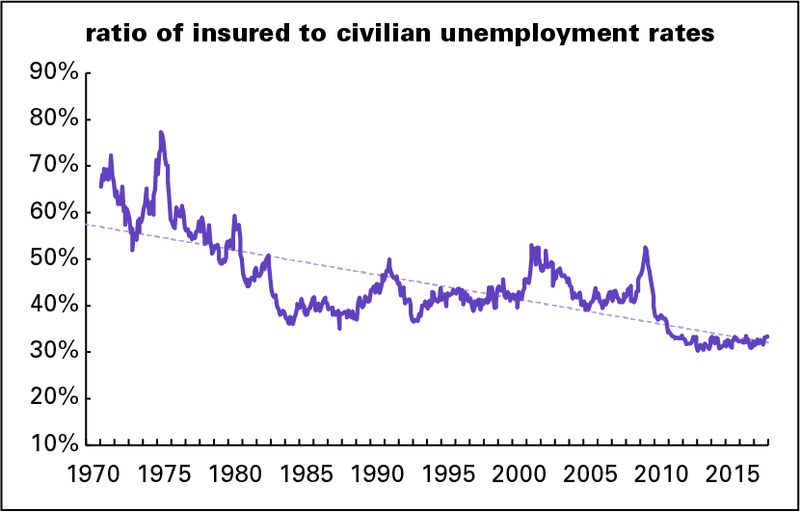 When we last visited this terrain, we noted that the insured unemployment rate was close to 70% of the official rate in the early 1970s; it’s less than half that, around 32%, today. Some readers countered that this could be explained by the rising share of the long-term unemployed in the total. True enough; now, those unemployed 27 weeks or longer account for 26% of the total, which would have been worse than a depth-of-recession neighborhood in the 1970s and 1980s. 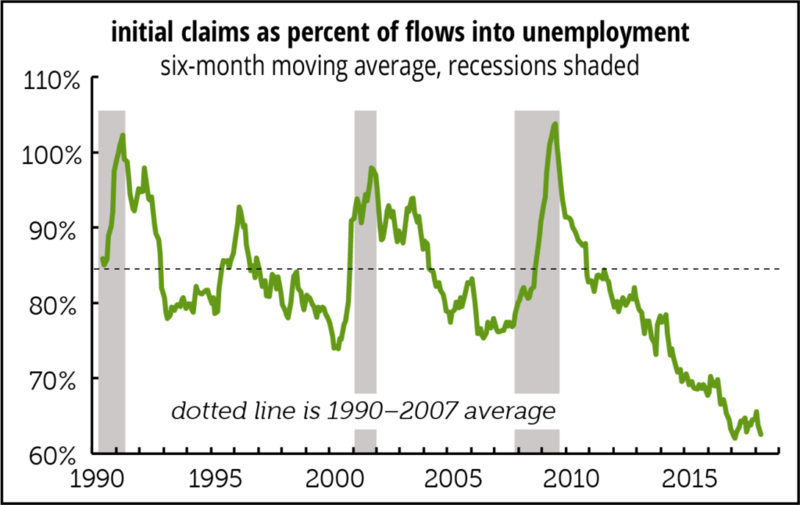 But the long-termers can’t account for this: initial claims are now around 62% of the flows into unemployment, more than 20 points below the 1990–2007 average of 85%, and had never been below 74% before 2013. A record, but for a weak reason. Some people, starting with the Tweeter-in-Chief, have been celebrating a record low in jobless claims. And, as the graph below shows, this is true. Were the share of the unemployed covered by the system the same as it was in 2000, the current level of unemployment claims (as a percentage of employment) would match that low. 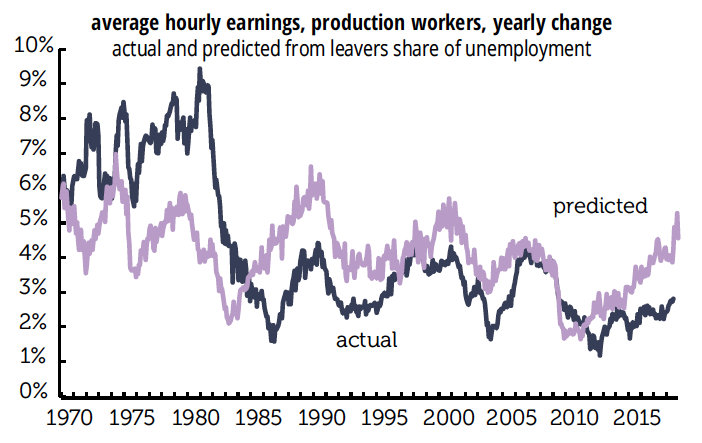 If it covered the same share of the unemployed as it did in 1979, today’s level would match 1989’s. The low level of claims is undoubtedly good news, but any notice of that fact should come with an asterisk.